Russian disciples of Goebbels, the virtuoso of the lie and nazi propaganda, have decided to leave their own yet more vile mark on the history of inhumanity. This time they have tried to lay upon Ukrainians guilt for the murder by Russian mercenaries under the leadership of Girkin (Strelkov) of four clergymen of an evangelical church in Slovyansk. They lied without special finesse. Instead of a routine fantastic interview with a female resident of Slovyansk or creepy revelations of other “eyewitnesses” of events, propagandists of the English-language radio service the Voice of Russia simply distorted the words of an adviser of the Minister of Internal Affairs of Ukraine, Anton Gerashchenko. The mutilated bodies of two priests from Slavyansk and of two sons of one of them were found, confirmed the adviser of the Minister of Internal Affairs of Ukraine Anton Gerashchenko. “We found a grave of two priests from Slavyansk, who were tortured and killed by the Ukrainian nationalists. The whole country and the whole world will know about the terrible atrocities that terrorists conducted. You will learn about it from concrete evidence,” said Gerashchenko. About what did the Kremlin lie to the whole world? 1. 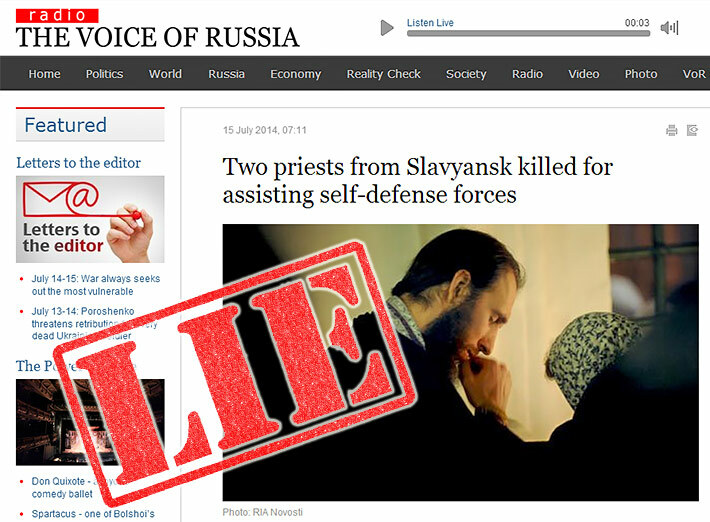 The priests were killed for helping self-defense forces, i.e., pro-Russian separatists. 2. They were tortured and killed by Ukrainian nationalists-terrorists, about whose atrocities soon the whole world will learn from concrete proofs. In addition, it should be noted that they are talking about the two sons of Pastor Oleksandr Pavenko of the Transfiguration of the Lord Church of Christians of Evangelical Faith, Ruvim and Albert, and also about two deacons of this church, Viktor Brodarskii and Volodymyr Velichko. Pro-Russian militants of the self-proclaimed DNR abducted them on 8 June, 2014 on Trinity celebration, right at the time of the festive worship service and took them to the former Ukrainian Security Service building in Slovyansk that had been commandeered by separatists. This was reported by many news media, quoting the words of a female parishioner of this church. At that date in Slovyansk one could not even talk about the Ukrainian Army or National Guard or the Right Sector activists. After all the absolute authority was in the hands of the Russian Girkin (Strelkov), who had served in the Federal Security Service of Russia. It is on him that the responsibility for the atrocities of his gunmen and the murder of civilians lies. There is yet another interesting detail in the lie of Russian propaganda. The Voice of Russia Radio represents the murdered clergymen as representatives of the Ukrainian Orthodox Church of the Moscow patriarchate (UOC MP), about which the reader was supposed to draw the conclusion from the photo and further list of “persecutions” of the Moscow patriarchate in Ukraine. It was in this vein that this article was reprinted by other publications. Among the “persecutions” of the UOC MP they mentioned the arrest of the priest Vladimir Maretskii. But they forgot to explain that he was heading a group of armed militants who were engaged in stealing ballots and disrupting the presidential election in Luhansk region of the eastern Ukraine. And for the sake of scale, Russian propagandists reported the kidnapping of a priest supposedly of the UOC MP. Although in reality they were talking about the archpriest of the Kyiv Patriarchate, Yuri Ivanov, who was kidnapped in Donetsk by pro-Russian separatists.